David Herro has been known to hang with some heavy hitters in professional wrestling. One look at his Facebook or twitter feeds and you will see a photo stream of the top names in wrestling. On a trip to Los Angeles earlier this year, Herro ran into a real hitter. Darryl Strawberry burst onto the baseball scene in the 80's and became one of the biggest stars. Personal issues derailed his career at times, but he still finished with 335 home runs. Knowing the marketing genius that Herro is, I wouldn't doubt that he tried to woo Straw for an appearance at Great Lakes Championship Wrestling. Straw may be a bit lanky for a real wrestling career, but Herro would find a spot for him on one of his shows. Herro knows how to promote and draw. Herro's next big show is Blizzard Brawl X. Will Strawberry make an appearance? Who knows? I do know with or without Straw, Blizzard Brawl X will be a huge event loaded with stars. 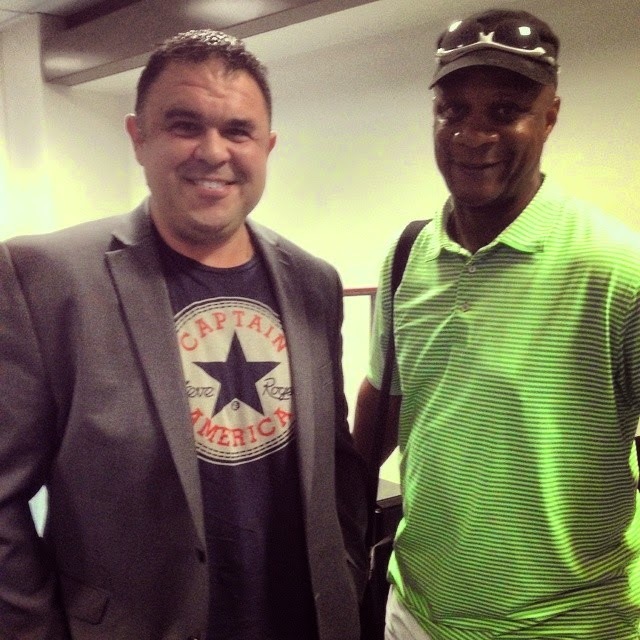 David Herro and Darryl Strawberry in Los Angeles, CA-August 2014.